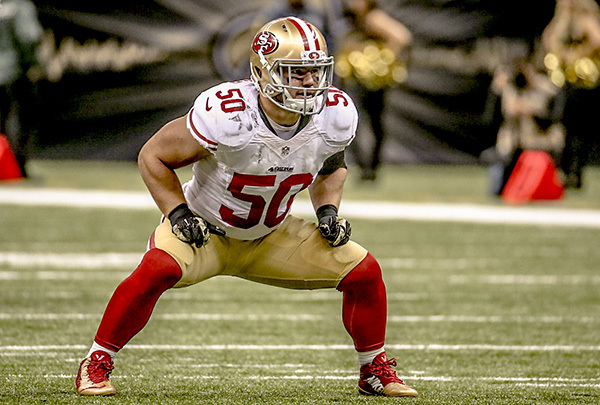 San Francisco 49ers’ rookie linebacker Chris Borland has announced that he is retiring from the N.F.L. due to safety concerns about the sport. Concerns about concussions and long-term brain damage has led Borland to retire after just one year in the league. Borland is considered to be one of the top rookies in the N.F.L. His decision to retire was first reported by ESPN. The new awareness of brain injuries related to the sport has caused concerns among many players. Reports keep arising of many older, long-retired players quietly suffering from dementia out of the spotlight. In recent years, researchers have determined there’s a link between repeated concussions and the development of symptoms like depression and dementia as part of the long-term neurodegenerative disease chronic traumatic encephalopathy (CTE). Borland is not the first high profile football player in recent months to cite safety concerns as the reason for retirement. Several days ago, seven-time All-Pro 49ers’ linebacker Patrick Willis made an announcement that he was choosing to retire so he would not risk further injury. The announcement from Willis came after linebacker Jason Worilds of the Pittsburgh Steelers, cornerback Cortland Finnegan of the St. Louis Rams, and quarterback Jake Locker of the Tennessee Titans announced their retirements during the off-season. Due to the concerns, the N.F.L. has adopted new protocols to properly diagnose concussed players and have outlawed certain kinds of hits that commonly result in concussions. It remains to be seen if these changes will allay the fears of the players or if Borland’s retirement will be the start of a wider trend throughout the industry.